3. Pain relief until you are cured. One can buy various mechanical aids that may or may not help, but the asanas address almost all of the causes of the condition and can cure it in almost all cases if executed judiciously. An example of this may be looking for a heel bone spur as an explanation for the condition; there are many cases where these have been surgically removed only to find the plantar fasciitis still persists. However, simply doing yoga often addresses most of these biomechanical issues thereby forming a key component of a long-term cure. Unless you diagnose it at its earliest stage there may not be a quick fix so it’s worth knowing the yoga poses; as well as helping to cure the condition, they can provide considerable pain relief along the way and offer an alternative to exercise conventionally done standing on painful feet. Judicious stretching is a key element in any cure, and this is where the yoga poses are invaluable. They are highly sophisticated in their age-old design and unsurpassable in restoring the structural integrity and alignment of the lower leg and foot thereby addressing the underlying condition that caused the plantar fasciitis to arise. The following poses address many of the problem areas that can trigger the condition. There are many causes of this condition, invariably interrelated; it is often not possible to make a conclusive diagnosis of any biomechanical issues causing the problem. Even respectable scientific literature is inconclusive and contradictory. In studies where participants did exercises recommended by professionals and other who did nothing at all, the plantar fasciitis was self-limiting in its longevity in both cases. So why bother doing any of this alt all. These asanas do give pain relief along the way, and more importantly, they address the underlying issues that triggered the condition. If you are in chronic pain then I suggest that you start with an adaption of Virabhdrasana 1 by simply stretching your calf muscle by placing both hands on wall and taking a large step back with one foot. Bend the front leg as much as you are able without letting the back heel lift. (photo A1) This should be held for 45 seconds and repeated 3 times a day. As movement comes, then add in as many poses below as you are able to do. One by one, drop a pose, and if the condition worsens then you know you have found your tight spot and resume the poses you stopped with renewed vigour. With this trial and error approach you can focus regularly on the poses that address the muscle group causing the issue. Regular calf stretching is essential; both the shallow and deep muscles, so the bent-knee and the straight-knee calf stretches are recommended. Ardho Mukha Svanasana (photos A2 & A3) and Parsvottanasana (photo B seen with the back foot parallel to the front foot), are both highly beneficial. If the legs are very tight, then place your hands on a wall rather than the floor so that you are stretching the legs while maintaining a concave back. Build up to holding each pose for 45 seconds and repeat 3 times a day on both legs, even if just one foot is injured. In both of these standing poses, you can work dynamically if holding is beyond you, but do this as well as trying to hold the pose for longer, not instead of it. In Ardho Mukha Svanasana, start with the heels lifted and then slowly lower them down towards the floor. Continue to work dynamically, moving the heels up and down, for 12 repetitions. Observe whether the foot departs from a straight plane while doing this; it is important to keep the foot correctly tracked and aligned as it ascends and descends, not allowing the ankle to roll in or out. Imagine a line being drawn from the inner anklebone to the outer anklebone, such that it would be parallel to the floor – this line ideally would stay parallel to the floor throughout the ascent and descent of the heel. Often, gait problems arise when one tries to walk in such a way as to avoid the pain of the condition- this up and down action identifies that and helps to remedy it. After you have prepared the body with Ardho Mukha Svanasana, try another, stronger, yoga pose, which works more directly and acutely into the tight fascia, namely, Virabhradrasana 1 (Photos C1 & C2). Execute this pose dynamically, lifting the back heel up and down, trying to disturb the rest of the alignment as little as possible in the rest of the pose, so only the back heel moves. If this is tough going or this range of movement is beyond you, then lean forward and place your hands on a wall with the back now at 45 degrees to the floor; you can then focus directly on stretching the back calf. Try to hold for 45 seconds on each side and repeat 3 times per day at least. Prasarita Padottansasna (photo D) can help some cases but not all. If it hurts after you have done it then put that in your sequence when you are at a later stage in your recovery. It stretches the outer calf, a common area for tension to build up with this condition so I suggest you focus on this area when massaging the lower leg. These poses are also effective in releasing the surface tension that can build up around the ankle, the top of the foot and the shin area. An incorrect gait often forms to avoid the pain of walking directly onto the heel, thereby exacerbating any biomechanical problems. With all of these asanas the method of how you approach the pose is critical; think of them like medicine, the dosage is as important as the product. In Virasana you are aiming to sit on a surface as hard as you can easily accept with a view to building up the length of time spent in it. Fascia is more like tendon than ligament, so it needs several minutes before it processes the benefit of the stretch. As we are aiming to build up the time spent in the pose it is imperative that it is not too uncomfortable at first and consequently abandoned. 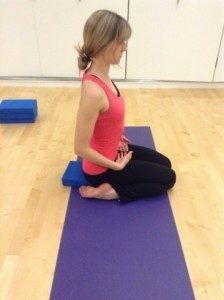 The first few times you do virasana it can be extremely painful so start with padding such as bolsters or blankets under the lower legs and ankles (photo F2). Only when that’s within your easy comfort levels try the poses on a folded sticky mat or carpet; in most cases support under the buttocks is also required (F1). Due to how we interpret pain (Central Sensitisation), any sensation in this area will be processed as “pain” by virtue of its association with the plantar fasciitis. The area is a source of pain and then you’re attempting to work on it in a way that appears to cause more pain. For a very interesting and entertaining Ted talk see http://www.massage-stlouis.com/why-pain-hurts-lorimer-moseley-explains. This offers an enlightening understanding of pain, and can give another perspective on how we interpret and manage discomfort. Therefore, it is important to start softly so that the stretch feels pleasantly challenging. Like most things, it gets easier with repetition, and the good news is, this tissue does lengthen quite quickly with regular stretching. If the surface under your feet is too hard, you more than likely will not hold the pose for long enough for it to make any significant, worthwhile improvement. That’s a shame, as it is avoidable if you follow these guidelines. The majority of muscle lengthening takes place in the first 20 seconds of stretching, however, fascia and ligaments are avascular tissue, that is, tissues without blood vessels, making them denser and less hydrated in terms of blood supply. In order to make a lasting impact on the cellular memory here, gradually build up the time in all the poses to a minimum of 2 to 3 minutes. As I said, it is essential to emphasise that it is particularly important when stretching the plantar fascia to start slowly and build up gradually, simply because under-doing it is a waste of time, and over-doing it adds painful muscle strain into the mix. Another asana that helps strengthen the front area of the fascia is Supta Baddha Konasana with particular emphasis on the key action of pressing the big toe mounds together. Some people advise picking up a cloth with the toes but this is less effective in restoring the arch and encouraging the arch of the foot to strengthen (photo G). Cramping in the foot is common when first undertaking all of these seated, but it passes with regular repetition. Contrast hydrotherapy is relatively benign yet effective; you simply contrast hot and cold water on the foot- something most easily achieved in the bath. Whilst you are there, it’s a good spot to lean forward into the most effective bent leg calf stretch, Malasana variation (photo H) done with knees together; the heat of the water helps the tissue to lengthen. This is the key bent leg stretch to compliment the straight leg stretches discussed earlier, and between them they stretch the lower leg as comprehensively as possible. The essence of the cure is to have freshly oxygenated blood drawn to the plantar fascia tissue, and then to rest it so it can begin to heal. Massage brings temporary relief but without an accompanying stretching program it will not affect a complete cure except in the mildest of cases. The most effective massage is a deep kneading-type action with the knuckles directly into the arch of the foot whilst the toes are completely flexed back towards the front of the foot. The plantar fascia can be seen and felt directly here. It will be tender so start softly but do build up to a stronger action. One can also massage calves and entire lower leg. This can be done directly flesh on flesh or by adding a few drops of Juniper and Cypress essential oils to a pure base oil like coconut or sweet almond oil; these essential oils act as a natural muscle relaxant. Following the same principle of stimulating the blood supply to the area, wearing sandals with small massage nodules all along the soles is enormously helpful; Birkenstocks do an excellent pair with full inner arch support. These can be very painful at first; start wearing them with socks for as long as you can tolerate, slowly building up to barefoot for an hour or two (don’t exceed 2 hours at one time). These can work to get you back on your feet when all other options have failed so are definitely worth trying. There are numerous devices available to purchase that stretch your calf for you, but none of them are necessary as the yoga poses stretch all the muscles necessary, with no equipment required other than a belt or long towel. Taking 3 x 1000mg Omega 3 or cod liver oil throughout EACH day is also very useful to help maintain the elasticity of the tissue. When you’ve over done it on your feet and they really are complaining you can’t beat sitting down and rolling the arch of the foot over a can or bottle of ice-cold liquid; it often gives exquisite and immediate pain relief and reduces pain directly. Regularly apply ice to the arch to stimulate the tissue when it feels inflamed. A top tip for pain prevention, most useful before rising in the morning, is to write the alphabet in the air with your toes before taking your first step out of bed. These ankle rotations can also be done several times throughout the day, preferably just before standing and can also be done whilst in all inverted poses such as headstand and shoulder stand. To stretch the plantar fascia directly place a belt or towel around the ball of the foot and pull the toes back to the head (photo I). This also works very effectively to reduce pain before you take taking one’s first steps out of bed in the morning. Likewise, if you have rested the foot during the day, for example after prolonged sitting, then the first steps can be painful. Try flexing the foot before placing weight on it. One student who was concerned she may not be able to enjoy a ski holiday as she had trouble even walking was delighted to find daily skiing actually cured the condition as in her particular case, her plantar fasciitis was caused by a tight calf muscle and this was being stretched due to the foot flexing position in the ski boot as above in photo H. This can be replicated at home by stretching the calf muscle regularly as advised. Another commonly agreed cure of plantar fasciitis is complete rest, in other words, to keep off your feet entirely. This is often not a practical proposal if one has responsibilities. It can be a breakthrough to discover the yoga asanas both rest and restore the affected areas, so you can rest pro-actively doing the floor bound and inverted poses. These give a general boost to well being and stimulate the immune system and this inevitably influences recovery time. They also bring about a very relaxed state of mind in which the desire to rest feels natural and enjoyable, allowing the body a window to start the healing process. It is particularly important that the foot is rested when it feels inflamed. Those who like to take regular exercise will find this requires some degree of discipline. However, as a comprehensive and varied asana programme exists inside the yoga canon, it is possible to give the body a full “workout” without standing on your feet at all, with asanas such as Supta Padangustasana (photo J) and the variations in Sarvangasana (photo K), Sirsasana and Viparita Karani (photo L). 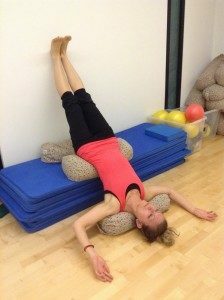 These should be taught by a trained Iyengar yoga teacher, and can be adapted to all ages and levels of ability using props such as blocks, blankets and a chair. To summarise, calf stretching with legs bent and straight, foot exercises to restore the arch, remedial and massage footwear, direct massage and taking supplements will all help your recovery. Depending on the severity of the case and when you start treating it, the problem can be cured in weeks or be chronic and long-standing in which case they will help the start of the recovery. 1. Even though everyone who has plantar fasciitis experiences heel pain in the morning, not everyone who experiences heel pain when taking their first steps in the morning has plantar fasciitis, so it is important to be sure and get a diagnosis. Often the condition is triggered by an event, such as an unusually long walk or run, or going barefoot or wearing flat shoes such as flip flops when the foot is used to more support. Heel spurs are often cited as the cause but then after surgery the condition still persists and indeed is worsened due to the set-back of recovering from surgery. It’s always worth trying all of the non-invasive cures before surgery. In extreme cases where walking is impossible, steroid injections may offer a quick fix, but paradoxically steroids undermine connective tissue so they can ultimately worsen the condition. 3. Always support the arches until the situation is remedied, after that it is a good idea to walk barefoot to build up the awareness of the correct actions necessary for the lower leg and foot musculature. 4. 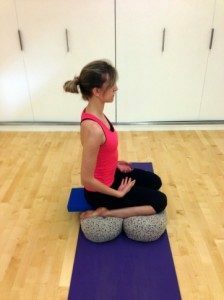 Props such as blankets, bolsters, cushions and blocks may be necessary to execute the poses effectively if the legs are tight. Always consult your health care professional and obtain full medical clearance before practicing yoga or any other exercise programme. Yoga must always be practiced under the direct supervision or direction of a qualified instructor. Practising under the direct supervision and guidance of a qualified instructor may reduce the risk of injuries. Not all yoga poses are suitable for all persons. Practising under the direct supervision and guidance of a qualified instructor, in addition to the direction of your health care professional, can also help determine what poses are suitable for your particular case. The information provided in this article is strictly for reference only and is not in any manner a substitute for medical advice or direct guidance of a qualified yoga instructor. The author assumes no responsibility or liability for any injuries or losses that may result from practising yoga or any other exercise programme. The author makes no representations or warranties with regards to the completeness or accuracy of information in this article.